Nosy Be is Madagascar’s prime beach destination. There are several islands in the Nosy Be archipelago, ideal for sunbathing, swimming, snorkelling and diving, but you will also find beautiful forests and fascinating wildlife. Relax on unspoilt sandy beaches or swim, snorkel, sail or dive in the pristine waters. There is an enormous diversity of colourful marine life here. Feast on fresh seafood from one of the open-air restaurants. Visit the RÃ©serve Naturelle IntÃ©grale de Lokobe ”“ home to black lemurs and the brilliantly-coloured Nosy Be Panther Chameleon as well as vanilla orchids and ylang-ylang trees. Turtle watching! Nosy Komba and Nosy Iranja are both important breeding sites for the Hawksbill turtle. In November and December, whale sharks feed in the water around Nosy B, while humpback whales travel through here in July and August. 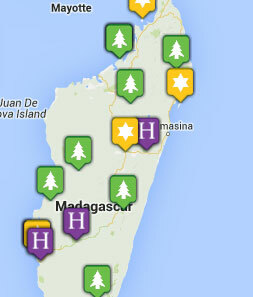 Head inland for forest walks, or visit a cocoa or vanilla plantation or crater lake. 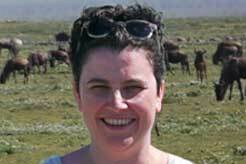 In general this region is warm from May to November and much from December to April. It doesn’t have so much rain in the rainy season as other parts of the north of Madagascar, but it does have rain throughout the year. There can be cyclones in February and March. 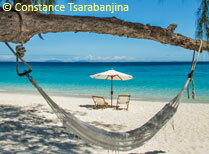 Nosy Be and the surrounding islands are best reached by air and regular flights are available from Tana. Driving is possible but the huge distances and standard of some of the roads, particularly during the rains makes flying the sensible option. This really is a piece of paradise, far from anywhere. Palm Beach Resort has a good range of facilities and the use of a beautiful stretch of palm-fringed beach, it's a good base from which to explore all the other islands. 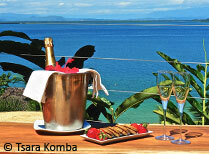 For something smaller and more intimate try Manga Soa Lodge with just 7 rooms, and enjoy Nosy Be in relaxing peace. An island getaway with pristine white beaches and clear seas, where you can enjoy refined luxury and seclusion. 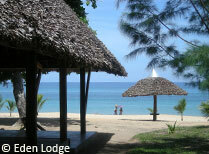 A small, friendly hotel set above a beautiful sandy beach on Nosy Be, ideal for rest and relaxation. 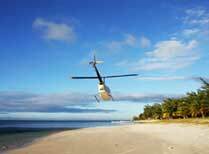 A new, exclusive luxury island lodge open all year and only reached by helicopter - your own island paradise. A private islands with spacious sea-facing suites, a large pool, 2 restaurants and wide range of land and water-based activities. 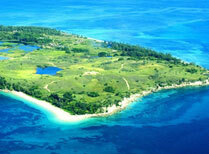 A 63-room resort with an impressive range of facilities on Nosy Be island, known for its lovely beaches. 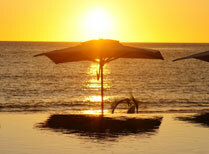 An idyliic beachfront setting, mix of water and land-based activities, delicious food and glorious sunsets.